Our December/January issue is available now! The December/January issue of NARC. is available now, from over 200 outlets across the North East. 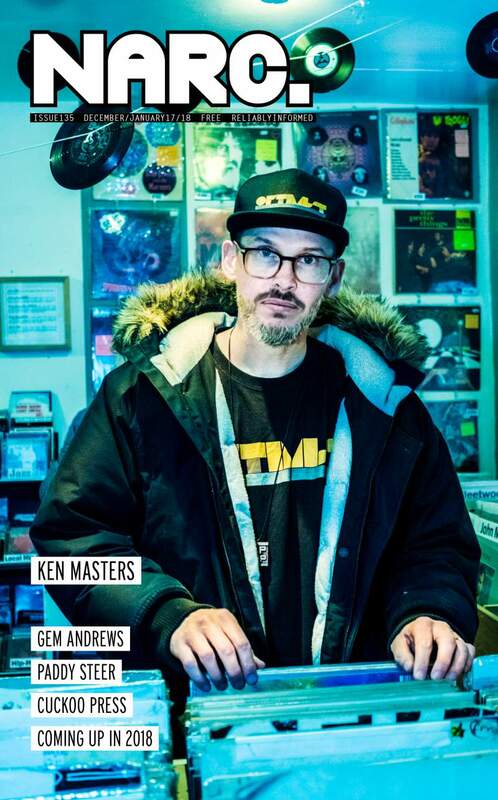 This month our cover star is the Godfather of North East hip-hop, Ken Masters, who chats with Nick Wesson about his career and what hip-hop means to him. It’s a packed edition as always, with previews and news on a whole host of events throughout December and January including Sextile at Think Tank?, The Unthanks at Sage Gateshead, 40 Years of Teesside Punk at Georgian Theatre, Vinyl art and music night at Riverside Lounge in Stockton, Destroyer at The Cluny, Bong at Cobalt, X-Mas Box festival in Darlington and Pay For The Piano’s 10th anniversary celebrations at Middlesbrough’s Westgarth Social Club plus loads more. The Culture pages feature all manner of art, theatre, comedy and film, plus there’s features on live computer game Dear Esther, the Library of Women Artists and murder/comedy podcast S’laughter, plus photography exhibition Kalpana’s Warriors at Abject Gallery, Sofia Stevi’s artwork goes on display at BALTIC, House of Blah Blah’s Christmas market, Shoecake Comedy Club’s rib-tickling events across the region and much more. Interview-wise, Lee Fisher talks melting pot influences and Nola sounds with Deslondes guitarist Sam Doores; Nick Wesson talks to North East rapper Endem about the release of his new album; Claire Dupree talks about spiritualism, politics and creativity with poetic songwriter Greg Genre; Ben Lowes-Smith talks to Gem Andrews about the launch of her new album and hhead of another visit to Newcastle, Lee Fisher was delighted to spend some time chatting to the astonishing Paddy Steer about bassoons, Brecht and doing something stupid. Plus, the Mixtape feature is by House of Blah Blah’s Keren Pearson, John Nellist waxes lyrical about the blues in the Get Into… section, there’s more info on Sage Gateshead’s exciting New Year New Artists mini-festival and a massive guide on what’s Coming Up In 2018, get your diaries at the ready! This issue also sees the inclusion of our annual Cuckoo Press supplement, produced by New Writing North’s Cuckoo Young Writers. Featuring poetry, prose and reviews by young writers, it shines a light on some of the brightest young writers in the region. We hope you enjoy it! Review-wise, we review demos by Dan Rochester, Daniel Chaney, Northern Horizon, Stroke The Globe and Sammy Zimmerman; albums by Tune-Yards, Of Mice & Men, The Spook School, Martin Francis Trollope, Ivan The Tolerable, Hollie Cook and more; plus reviews of tracks by Swine Tax, Sam Fender, Cows Lying Down and more. The live review section features reports from Godspeed You! Black Emperor, Profumo, Amusement Parks on Fire, Protomartyr, Avalanche Party among others.